The portable industrial dockingstation RoadTop® RT 300/2-PCC expands every notebook with two standard ISA slots. Interfacing is done through industry standard PCMCIA / PCCard Card. 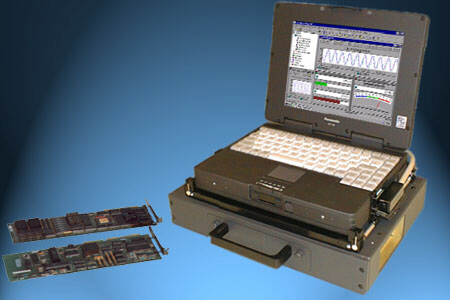 Signal conversion is realized by the sophisticated PCMCIA - ISA Xtenderbridge circuit developed by Axotec Technologies. The unit housing is manufactured from AlMg3 and sealed with a robust synthetic powder coating. Thanks to the compact design the complete system is small and lightweight and fully industrial proof. Cooling of ISA expansion cards and of power supply unit is made by means of overpressure air stream with integrated dust filter. Thus the unit is optimal protected against dust. All RoadTop® dockingstations are equipped with a stable and simple adjustable snap in holder. That holder connects the notebook computer with the docking station to a compact, mobile unit. Installing and removing the notebook is a trifle.